We’ve signed an agreement with the peak industry body for the information and communications technology sector. 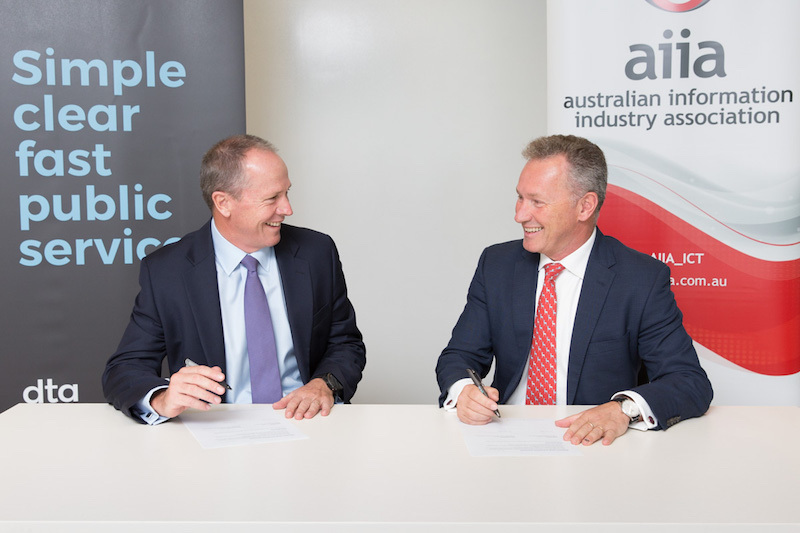 Caption: Gavin Slater, CEO of the Digital Transformation Agency and Rob Fitzpatrick, CEO of the Australian Information Industry Association sign the memorandum of understanding. In digital transformation, you can’t do it alone. This change requires all of us — government, industry, and the best and brightest minds across the economy — to deliver better results for the individuals and business that have to use government services to get things done. This memorandum of understanding with the Australian Information Industry Association spells out how we aim to work together. In it we commit to engage early, seek input, share ideas and draw on each others experience and expertise, to benefit major projects including our work on ICT procurement reforms, digital identity and building skills in digital disciplines across the Australian public service. In a statement welcoming the new agreement, our Chief Executive Officer Gavin Slater said involving industry in government transformation was crucial to success.